This Snicker Peanut Butter Oreo Pie will make you swoon. 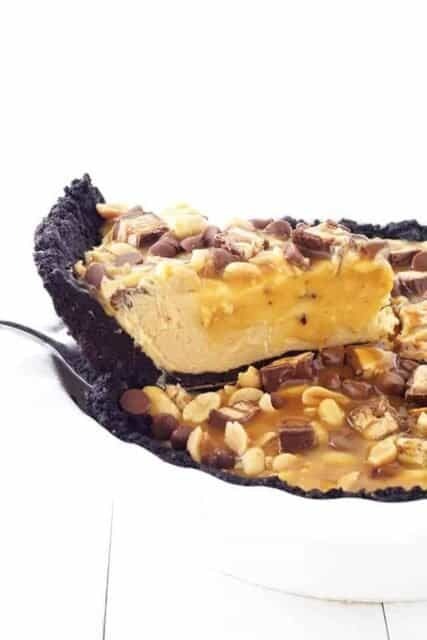 An Oreo crust is filled with smooth peanut butter filling and topped with Snickers, peanuts, caramel sauce and chocolate chips. Hi friends! 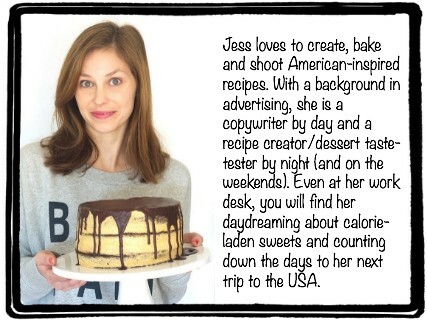 It’s Jess here from Sweetest Menu – all the way from Australia! A big thank you to Julianne for letting me share a special recipe with you today. Are there any fellow peanut butter lovers out there? 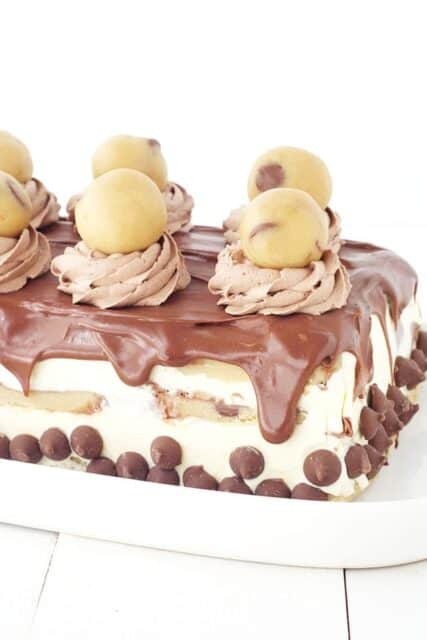 I have a decadent treat for you today. 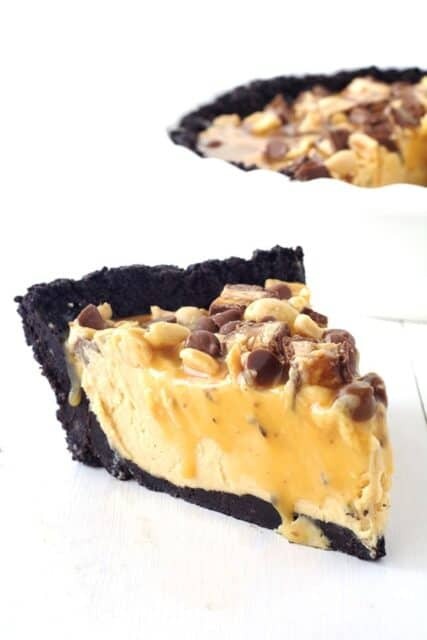 Introducing my Snickers Peanut Butter Oreo Pie! 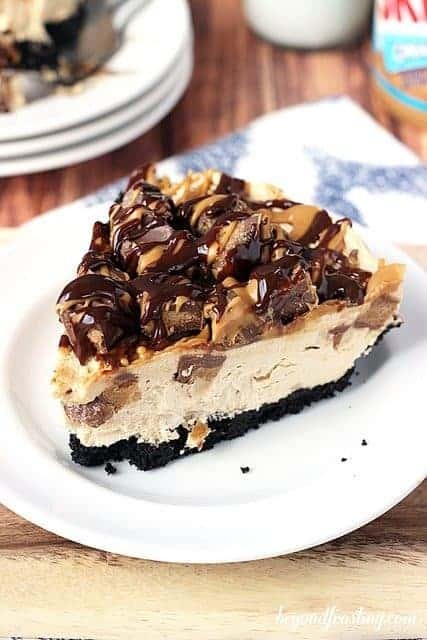 This gorgeous no bake recipe features a chocolate Oreo crust, a creamy peanut butter cheesecake filling, all topped with pools of homemade salted caramel sauce, chopped Snickers bars, roasted peanuts AND chocolate chips. It’s heaven on a plate I tell you! 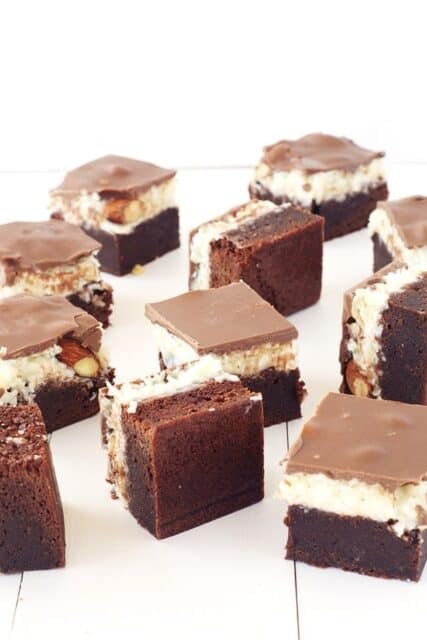 Aren’t no bake recipes the best? I just love them! Not only do they take less time to make, but they always taste delish and this pie is no exception. 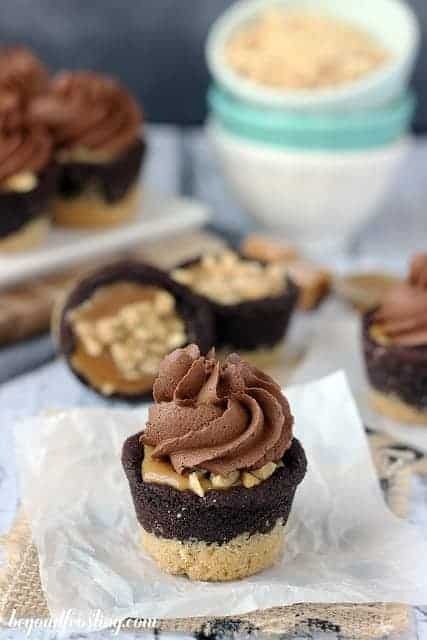 The filling is creamy with the perfect amount of peanut butter for that bit of sweet and salty action. It firms up perfectly all on its own in the fridge, so there is no need to fiddle around with gelatin. 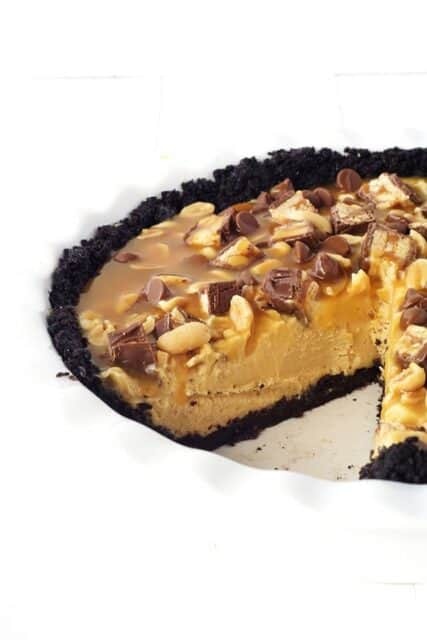 The drizzles of salted caramel and scattering of roasted peanuts means the whole pie tastes like a Snickers bar. 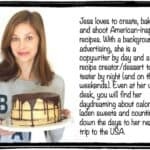 And of course, I can never resist pairing peanut butter with Oreos (see my Peanut Butter Oreo Buckeyes or my Loaded Peanut Butter Bars) so I just had to use an Oreo crust. I have been on a bit of peanut butter roll these last few weeks. What doesn’t peanut butter go well with? I mean seriously, there’s PB & chocolate, PB & jelly, PB & Oreos, PB & Marshmallow fluff and now PB & caramel. But I think this pie is my new favourite peanut butter treat. It is creamy, crunchy, sweet and salty. You could use store-bought caramel sauce too if you are a little short on time. But if you can, I do recommend making your own salted caramel because it really just takes the dish to a whole other level. Well I have just convinced myself to go eat another slice! If you try it, please show me your pics by tagging @sweetestmenu on Instagram! Crush your Oreos (filling and all) until they resemble fine crumbs using a food processor or if you don’t have one, use a plastic zip lock bag and a rolling pin. Melt your butter in the microwave, stirring in-between 10 second bursts and then pour over your Oreos. Stir until all the biscuit crumbs are nice and wet and then pour them into your prepared tin. Use the back of a spoon to gently push the crumbs in your pie tin so they cover the bottom and go up the sides. Pop into the fridge. To make the filling, first whip your cream until firm peaks form. Set aside for a moment. Place your cream cheese and sugar in a large mixing bowl and beat for a minute or two until nice and creamy. Add your peanut butter and powdered sugar and beat until until completely mixed through. The mixture should thick and creamy. Then gently fold through your whipped cream. Pour the peanut butter mixture over your Oreo base and pop in the fridge for at least 3-4 hours or even overnight. 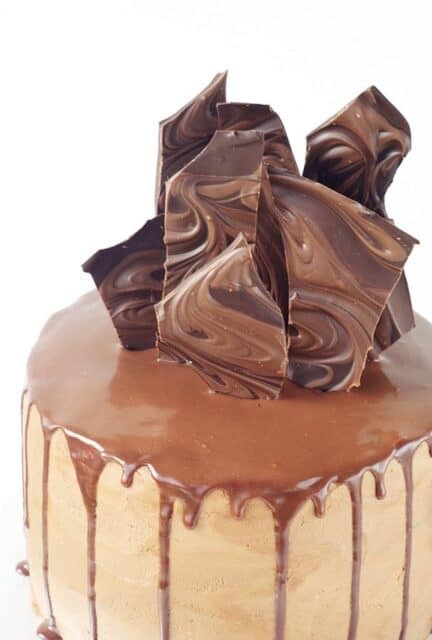 To decorate, pour over half of your salted caramel sauce. 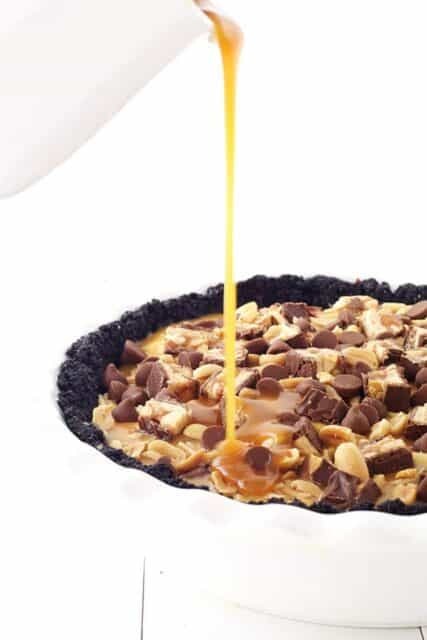 Scatter your chopped Snickers over the top of the pie, then add the roasted peanuts and chocolate chips and finally top with the rest of your caramel sauce. Pop the pie into the fridge until you are ready to serve. I most definitely need this in my life. Snickers. Peanut Butter. OREO. I mean COME ON! How could I say no to this? ?